What Did Men Wear in the 80s? Rugged and durable, big men's western clothing epitomizes laid-back apparel with a cool, country vibe. Not only are the sizes versatile, but the styles are, too! Western clothes take their inspiration from the traditional clothing worn in the American West. Associated primarily with cowboy hats, embroidered tops, vests and rough-hewn jeans, western wear does in fact extend well beyond these realms. The range includes everything from tuxedo-style coats and boots to belts and work shirts. If you're in the market for western clothing in plus sizes, you're in luck: There's lots of variety out there. Be aware, though, that it may initially prove challenging to build an entire plus size western wardrobe. Certain items are more readily available than others, but with a bit of legwork it is possible to find everything you need to get comfortable in head-to-toe western wear! Ann Eve Collection: Consider this proof that you may need to shop around to find everything you need! Ann Eve Collection carries a small selection of plus size western shirts for men, and it's wise to check back often for new arrivals. The company offers a refund minus a 20 percent restocking fee within two weeks of shipment; after that, store credit is provided. Cavender's: Probably one of the best options on the Internet for tracking down a wide selection of plus size western wear, Cavender's offers everything from shirts to jeans in big and tall sizes. Available brands include George Strait by Wrangler, Cinch and Wrangler, to name a few. Complete your look by adding a cowboy hat and western-influenced belt to your order. The company will provide a refund within 30 days of purchase. Sheplers: Since 1899, Sheplers has specialized in western attire and accessories. The company's large selection of big men's clothing is especially impressive, and the Web site makes it simple to search by size. Find everything from plaid, striped and solid shirts to sport coats and jeans. The company's "handshake guarantee" ensures that items may be returned or exchanged for any reason, minus delivery charges. You know where to shop, but do you know what you should be looking for in your western wear? In addition to clothes that simply fit, pay attention to the distinctive details that make them quintessentially western in appearance. Shirts boast a unique appearance, and are often what truly call attention to the outfit. Typically made of cotton, shirts usually have long sleeves and are often accented by prominent button snaps in diamond shapes. They are thoroughly starched, too! During the 1940s and '50s, fancier dress shirts were favored by the likes of Gene Autry and other famous "cowboys." Don't skimp where coats are concerned. Available in sturdy, thick leathers in a host of rich colors, these serve as the perfect finishing touch to a western ensemble. In addition to seeking out leather, also look for dark fabrics bearing visible embroidery along the collar, wrists and pockets. Blazers, frock coats and everyday cowboy jackets are common styles. Pants are tough, rugged and hard working. The most western-appropriate look comes from a pair of jeans, such as the Wrangler Western Cowboy Cut Original Fit 13MWZ jeans. 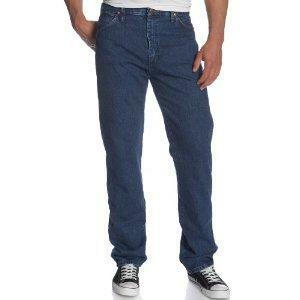 These were originally designed in 1947 and have proved themselves the denim of choice for cowboys everywhere. They are available in big and tall sizes here.